A Southern Angle-headed Dragon (Hipsilures spinipes), photographed at the Goomburra section of Main Range National Park. 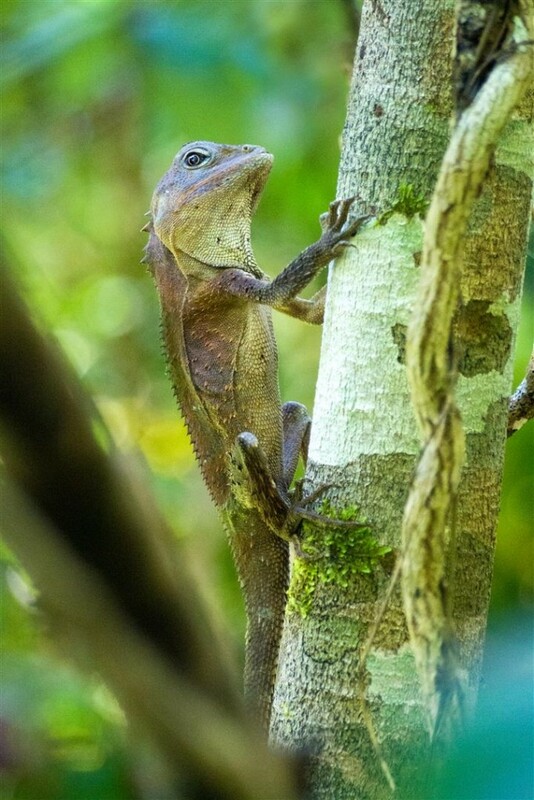 The Southern Angle-headed Dragon is found in sub-tropical rainforests in south-eastern Queensland north to the Gympie area and in northern New South Wales. This small, well-camouflaged reptile likes to perch on the trunks of trees where light penetrates to the forest floor, such as at edges of creeks and tracks. Southern Angle-headed Dragons eat insects and arthropods, such as centipedes and spiders. In December, females lay up to seven eggs in shallow nests in clearings, and there is evidence of communal nesting. Photo R. Ashdown. An earlier blog post on rainforest dragons. This entry was posted on January 12, 2015 by Robert Ashdown. Beautiful image. Looks like it’s posing just for you! Can’t remember ever having seen one of these before. Will have to keep an eye out! Ah, he has the look of the Earl of Grantham in his eye. Must also love his beautifully lush and colorful surroundings. Thanks John and Charly. I count it a great honour to spend a minute in the presence of such a fascinating reptile! Cheers and all the best. I’ve never seen one of these before. What a great lizard it is. I must keep my eyes peeled for them next time. I am often on Main Range National Park. Excellent photo! I’m a naturalist and photographer living in Toowoomba, Australia. In this blog I share photographs, and often the stories behind them, as well as images and writing from guests. Nothing here is intended to be too academic, so you may stumble across errors in fact, grammar, punctuation, spelling and, heaven forbid, taxonomy. I'm hoping there'll be no errors in my use of apostrophes, as that would be unforgivable. Let me know if there's something that you feel cries out to be fixed. More organised galleries of my photographs can be seen on my main website (see link above in the main menu). Thanks for visiting. Please leave a comment if you have time.